Go to Computer Configuration > Administrative Templates > Windows Components > BitLocker Drive Encryption > Operating System Drives. One the right pane, double-click on Require additional authentication at startup. After all that is done, you need type a few commands to get it going. Here’s how. Start your command prompt (make sure you run it as an administrator). Type; “manage-bde -protectors -add c: -TPMAndPIN”. 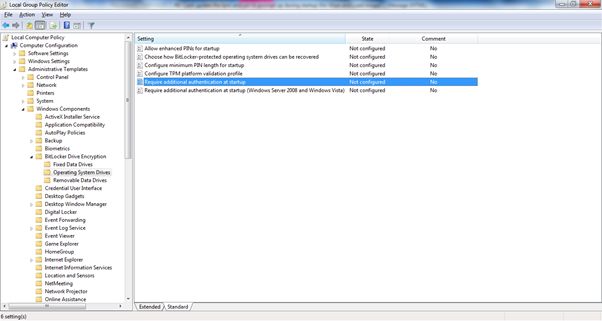 Then type; “manage-bde -status” to check whether the TPMAndPin protector has been added. Personally, I haven’t read them all – but I have read the Understanding Microsoft Virtualization Solutions book – mainly to make sure that I can keep up with some of my more technical colleagues and customers, and to understand what the true potential can be in different scenarios.